Every other year J-CAN brings culinary professionals and houseware/specialty food buyers, journalists, and interested folks to Japan to visit knife makers in Sakai City, home of some of the last great knife makers in Japan. The tour also includes a visit to a few other related industries in and around Osaka (Winery, Miso, Soy Sauce, Vinegar etc) The trip includes a maker experience with the knife makers as well as a focused trade show and minor sightseeing. It is a great focused opportunity to get an introduction to Japan or expand on knowledge from previous visits. The tour ends in Tokyo for a tour of the famed Tsukiji fish market. The night before we’ll have dinner at Sushiko Honten one of the top sushi restaurants in the world. The access offered to those on the tour is incredible and is not just about meeting, but really seeing and working with those we visit. The Hands-on nature and access provided make it a “once-in-a lifetime” experience. Led by both native Japanese as well as experienced gaijin the trip yields business ideas and discussion as people in various aspects of the industry travel and share each other’s company for 4 days in a foreign land. JCAN will arrange for all accommodations and meals during the trip. Unless otherwise noted you will be expected to pay for your hotels, transportation to Japan and meals(some meals are included as noted) We will make every effort to make reasonable lodging and travel arrangements. -As this will be our first night together in Japan we will have dinner and catch up, and get ready for an exciting few days to come. 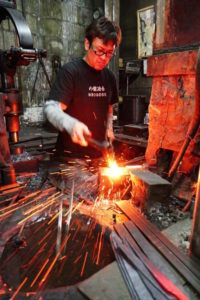 -Mr Enami makes most of the traditional forged knives for Kikuichi. He is a master and will lead you through the forging process, from initial hammer welding through shaping, initial grinding and tempering. After a hot morning in the pit forging your knife, we’ll move on to lunch and a visit to a nearby food manufacturer for a tour and visit. The handle making shop is incredible and you will see how these craftsmen are carrying on centuries old traditions. Food is of course revered in Japan, and we’ll visit a manufacturer of quality product to see what they’re working on, this is a nice addition since we’re making knives to cut food! We’ll then likely have some free time to see what local life is like in Japan and then have dinner. Saturday July 11th – Sharpening at the Sakai Knife making Museum and Trade show of knife makers in Sakai. Dinner with Knife makers and Sakai city officials. -Meeting in the morning at the Sakai Knife Making museum we’ll get to the grindstone and learn sharpening techniques from the masters, as well as final assembly. After that we will have a trade show just for us presented by the major knife makers in Sakai City. Review their offerings, place orders and see what these makers have to offer, much of which is yet to be offered in the USA. After the trade show we’ll raise a glass (or three) and share a meal with the knife makers and city officials from Sakai and Osaka. Sunday July 12th – visit to Nara for engraving, visit to Todai-ji, and Kusaga Shrine. -After checking out of our hotel we’ll head to the Kikuichi headquarters in the Nara park, where you will engrave your knife for the final touch. We’ll have some time for lunch and sightseeing. The famous Nara deer, Todaiji temple the home of the largest bronze buddha in the world as well as the largest wooden building in the world is in Nara park and is an amazing place. We’ll then catch a Shinkansen (bullet train) to Tokyo. We’ll check into the hotel and have dinner at Sushiko Honten. -We’ll meet around 4am to tour the famous Tsukiji fish market on the Tokyo waterfront. The chef from Sushiko Honten will be our guide and we’ll have unprecedented access. The market is essentially closed to “tourist” traffic. After years as a guidebook staple the fishmongers decided that all the tourists were getting in the way of their work, and you can only access the market if you’re a buyer. Especially the daily fresh tuna auction, which we should get to visit. This is something that nobody gets in to anymore, and when the market closes to move this November, foreigners will likely no longer be allowed to visit at all.